Earrings are worn throughout the world by people of different cultures and backgrounds. They are worn mostly by women, but have become a popular fashion trend for men. Many styles of Peruvian earrings show the artisan’s personal preference, some may reflect Peruvian culture. Many Peruvian earrings are handcrafted by skilled artisans. You might not find real luxury silver or gold on a handcrafted earring, but the semi-precious or faux gemstones and alloy metals used may give the earrings a polished and shiny look. Earrings from crafters in the lowland region of Peru might reflect the tropical climate, and come in colours like green or brown. They commonly have tropical decorations. Ethnic Peruvian earrings are commonly colorful and reflect the typical style of the native Quechua or Aymara people living in the rural Andes region. Thread earrings are a popular style among handcrafters. Threaded feather-shaped earrings are typical and have fabric woven around a feather-shaped frame. They usually consist of 3 or 2 colours arranged horizontally. 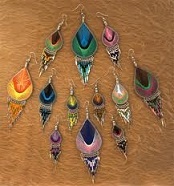 The earrings may resemble a bird feather, some have many colors and resemble butterfly wings. Thread earrings are relatively simple to make at home, and may require nothing more than skill in weaving. Beaded earrings are also common. A popular style is a circular pendant with colorful, flamboyant beads hanging from it. Many Peruvian earring artisans have taken to the artwork of the ancient Incans for inspiration of their designs. Common patterns and designs of Inca inspired Peruvian earrings are the sun, moon and stars, which were Inca deities. Exotic beaded earrings, sometimes called ‘Inca beads’ are also crafted. In order to keep a natural appearance to it, some crafters use natural seeds or wood that the Incans once used, as pendants for the earrings. Beaded earrings are great souvenirs for a tourist visiting a place like Cuzco in Peru, which has rich Inca history. The wood in Peruvian earrings is polished to attain a shiny appearance, and it’s usually dark brown. The wooden pendant may be circular with designs on it, or the pendant itself could be carved into a shape. Another common Peruvian earring style has three diamond or triangular-shaped pendants made of alloy metals. The pendants are usually vertically aligned and have many Inca designs and patterns on them. Beads usually hang from them. This makes the earring larger than many other styles. Along with ethnic and Inca inspired earrings, Peruvian crafters make everyday conventional earrings. Some earrings are made from precious metals or other alloy metals to imitate the shiny qualities of silver and gold. Ersatz gemstones could be made of glass or plastic. There are larger faux or real silver earrings that are suitable for business and office settings. Crafters also make small earrings with transparent pendants, and threaded ones that are good for occasions. A rare form of opal, known as Peruvian opal (or Blue opal) is found in Peru. You can find this bluish-greenish gemstone on many Peruvian earrings. High quality opal is smooth, and gives the earring a luxurious look, suitable for big occasions. Many of the earrings go with a matching necklace.